As a general rule, wines embellished with a celebrity name aren’t particularly well made. Relying on their fame to sell the wine, they siphon schlock into a bottle and call it a profitable day. (Read my blast of this trend from a few years ago.) But I have admit that the pop group Train at least tried to make a decent Pinot Noir. Jimmy Stafford, the quiet lead guitarist for Train, is a huge wine fan and teamed up with California winemaker, James Foster, to make their line of Save Me San Francisco wines last year. James is Senior Winemaker at The Wine Group, the same company that introduced generic Flip Flop Wines, Franzia and Big House to the wine drinking public. Not a huge endorsement for making great juice, so I didn’t have major expectations when I popped the (fake) cork on this bottle of 2011 Soul Sister Pinot Noir. I have a confession to make: Although I live in the fortuitous California wine country, it’s pretty rare that I visit tasting rooms. I remember back before I relocated to Sonoma County from Florida, I would ask friends who lived here what tasting rooms I should visit. I sought out the small, the family-owned, the tasty… and many had no insight. At the time, I was like, “What?? You don’t go tasting on the weekends and loll in the vineyards?” I was aghast. I have a confession to make: Although I live in the fortuitous California wine country, it’s pretty rare that I visit tasting rooms. I remember back before I relocated to Sonoma County from Florida, I would ask friends who lived here what tasting rooms I should visit. I sought out the small, the family-owned, the tasty… and many had no insight. At the time, I was like, “What?? You don’t go tasting on the weekends and loll in the vineyards?” I was aghast. The ubiquitous rep of Pinot Grigio is legendary. Grown in Italy for centuries and quaffed at many a trattoria by the ceramic pitcher-full, this humble grape actually bears French roots, not Italian. Pinot Gris is the name elsewhere in the world, from France’s Alsace region to Australia to New Zealand. But it arrived later to America in the mid-1960s, planted by one of Oregon’s wine country forefathers, Eyrie Vineyard’s David Lett. I’ve finally comes to terms with the fact that I’m a Pinot-lovin’ woman. Call me an acid freak, but I just can’t sit down with only a glass (and no food), pop a cork on a Cabernet Sauvignon and enjoy the hell out of the experience. Nope, won’t happen. Too assaulting. Cabernet is a food wine, plain and simple — the tannins don’t allow my palate to fall backwards into its loving yet astringent arms. But Pinot Noir is a different story. It’s the smooth operator — the wine that massages your shoulders before making its move. It guides your hand to the glass, introduces its beautiful self to your life and entertains… nay… does a lap dance on your tongue. Seduction complete. 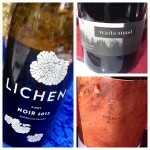 Much fanfare surrounds the 2009 vintage of Pinot Noirs in northern California. Nature bestowed the ideal blend of rain and sun to create a blanket of perfectness for this very finicky grape. It ain’t easy satisfying this LA housewife of a fruit, but 2009 delivered the goods. Stock up now as 2010 and 2011 pretty much sucked. Many 2009 Pinot Noirs — depending on where they’re grown — offer up bright cherry and raspberry fruit, elegantly subtle tannins, perky acids and a well-rounded personality reflecting the fruit’s growing season happiness. If nature treats the grape well, it produces better wine. MIlla Handley knows what to do with great Pinot grapes. King Estate specializes in Pinot Gris and Pinot Noir, and that’s what I’ve been sipping on these past eight years since I met them. Still family-owned — like most wineries in Oregon — they’ve expanded their horizons with their other, more affordable (and still tasty) Acrobat Pinot Noir and Gris. I really admire what these guys have been doing.